Somewhere along Minnesota Highway 19 west of Red Wing, Minnesota. THERE’S SOMETHING about a pick-up truck on a gravel road and high-line wires (as I termed power lines in my youth) that stretch seemingly into infinity, and how the two mimic each other—the road and the wires—in strong horizontal lines. There is something poetic and lonely and haunting in this rural winter scene, almost like the plaintive lyrics of a country western song or strings strung taut upon an acoustic guitar. Is he destined to break her heart or has he already broken it? 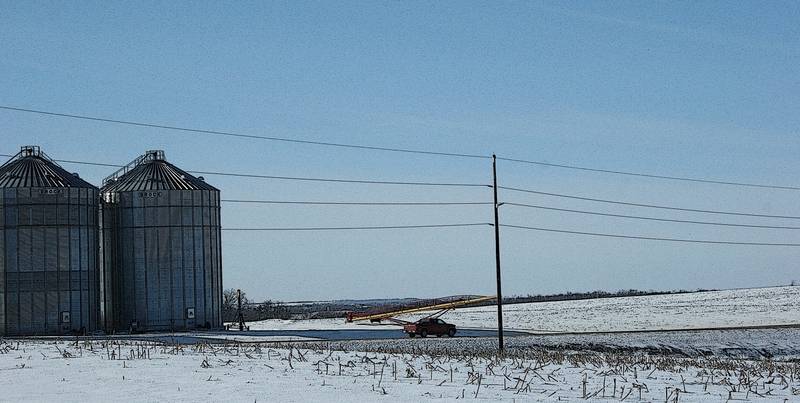 Maybe it’s the other way around – she broke his heart and there’s nothing else to do but drive in to that vast snowy space beyond the shadow of the silos. Excellent, Kathleen. I thought of that when I wrote this piece, wondering if anyone would question whether she broke his heart instead. Tires on gravel used to be the common sound around here and was a part of the rural setting but with the coming of asphalt on our road, and others, the “rural/farm” feel left in favor of the more “urban”/city feel. Somewhat sad but I was glad when it happened cuz it was much nicer to hang clothes on the lines in the summer and know that gravel dust wouldn’t be penetrating the fibers while they were drying!!!! Yes, gravel roads certainly have their downfalls of dust, ruts, washboard surface, slower travel, etc. But there’s nothing quite like gravel to, as you say, exude that rural/farm feel. My only worry here when I hang out laundry is the dust stirred by the occasional sweep of the street sweeper. Ooops! forgot about that! Here’s a thought that shows my age……growing up on St. Paul’s East Side, just 4 blocks from a RR tracks, all the ladies would rush to get the clothes off the line before the noon “Chicago 400” and subsequent freight train would run by. The first wasn’t too bad as it was a shorter passenger train, but the second was very long and (during my elementary school days) were coal fired!!!! The sooty smoke would travel quite far and we were north of said tracks (prevailing summer winds from the south) which would have very unpleasant results!!! !…..So much for a little “bunny trail” thought!!! LOL! Oh, my, that is worse than dust from a road or a street sweeper. It really is….BUT that is one for the history books (as “they” say!). Loving your capture – I think he is on the way home to her:) Happy Monday! I like that thought better than him breaking her heart. We can all write our own endings to this story/song. She just dropped off lunch, and has his truck for the day while her’s is in for repair, Ha Am I taking it a bit too far? Oh, Jackie, that’s another creative twist on this rural scene. Readers, keep giving me your spins on the photo. I am enjoying this. Doesn’t this scene remind you of “home?” It does me. It is such a moment…and I remember calling them high-line wires too!! Grateful for the memories and for having you bring them up through your blog! We are sisters of the prairie, you and I.